“The Pattern of Calvary: A Paradigm Shift” from Christian Faith Publishing author Jack Cochran is a powerful call to the hidden truths in the Old and New Testaments that have long gone unexamined, but which prove to have monumental consequences of the sort that would result in a global paradigm shift—especially when properly understood in the context of the current spiritual darkness infecting every nation and branch of faith with disbelief and doubt. 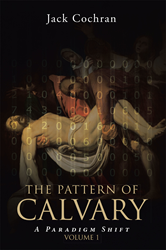 “The Pattern of Calvary: A Paradigm Shift”: an accessible game-changer in the field of spirituality, theology, and international religion. “The Pattern of Calvary: A Paradigm Shift” is the creation of published author Jack Cochran, who was driven on this quest for the truth based on an inextricable sense that most of organized religion is a great con. Published by Christian Faith Publishing, Jack Cochran’s new book is an utterly fascinating inquiry that draws parallels between the state of the spiritual world today and the powerful, pervasive illusion of reality as seen in the movie “The Matrix,” a comparison that prods the readers awake to a reality as foretold in Scripture. Divinely inspired and circumspect, Cochran’s book sheds new light on obscure truths that, once detonated, can easily change everything. View a synopsis of “The Pattern of Calvary: A Paradigm Shift” on YouTube. Consumers can purchase “The Pattern of Calvary: A Paradigm Shift” at traditional brick & mortar bookstores, or online at Amazon.com, Apple iTunes store, or Barnes and Noble. For additional information or inquiries about “The Pattern of Calvary: A Paradigm Shift”, contact the Christian Faith Publishing media department at 866-554-0919.